Fenton used its Garden Mums blank to make this 6-inch advertising piece. It is found in flat plates, handgrip plates (as shown), and ruffled bowls. 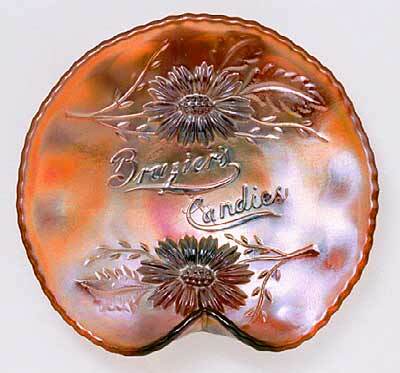 The lettering reads "Brazier's Candies." The Brazier's Candies piece was produced as a six-inch bowl, both ruffled and ice cream shape, a handgrip plate, and a flat plate, These are Fenton products that contain the Garden Mums pattern on the front and a wide panel exterior. Amethyst is the only color known. For many years it was not known where the Brazier's Company was located. Then, according to the Carnival Glass 101 site, in 1997 Bob Williams discovered that this company was located in Helena, Montana. In my further research I found an excellent article from the Queen City News of Helena, from February 12, 2003, that shed more light. Brazier's Candy was located at 9 North Main Street in Helena. It was advertised as "The Choice of Cultured Taste." They carried a full line of candy, ice cream, ices, frozen pudding, and fancy cakes. The candy was the most popular and came as hand-rolled chocolates, marshmallows, nougat, caramels, and gumgums, plus penny candies. Proprietors were John Brazier, president, and his brothers, Frank, vice president, and Albert, secretary-treasurer. They also had a wholesale outlet at 115 West Lawrence, also in Helena. The business began about 1905, and in time, the candies were sold statewide and then to adjacent states. In April of every year they started planning for the Christmas season by ordering specialty items to promote their products. The carnival glass plates and bowls were some the more popular choices. Each piece was likewise filled with candy. Their store was later moved to 113 North Main. In 1914 they attempted to move the store to Great Falls, Montana. This move proved unsuccessful, and they remained in Helena. The business closed after WWI because of a sugar shortage. As a side note, Gary Cooper, the actor, was born in Helena, and his mother was a member of the Brazier family.